Musics biggest night, The Grammy’s, has come and gone and social media has created a lot of buzz surrounding the show from the red carpet to the usual Grammy snubs. This review is not a play by play of the show being that I wasn’t fully interested. A lot of the performances were very somber and nothing made me jump out of my seat. Anyway, here are my highlights. 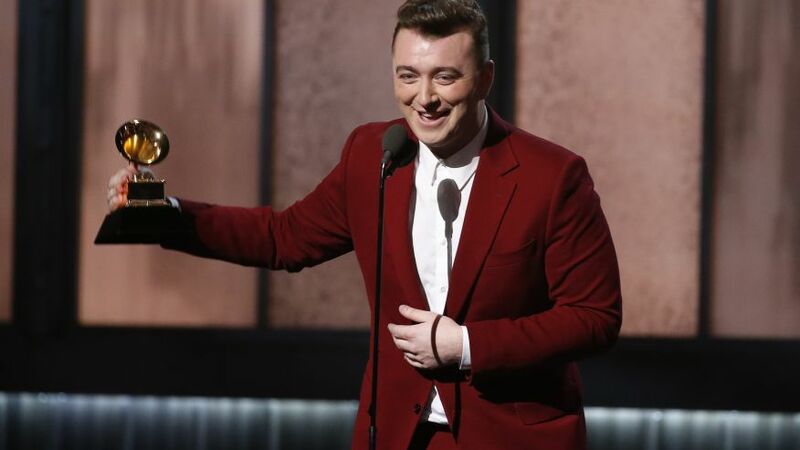 First of CONGRATS to the biggest winner of the night, Sam Smith. He won 4 Grammy’s: Best New Artist, Best Pop Vocal Album, Record of the Year, and Song of the Year. His feat reminded me of Adele as they both capitalized on breakups to make amazing music. The first performance that I loved was Hozier’s ‘Take Me To Church’ alongside Annie Lennox who then performed ‘I Put a Spell On You.’ I’ve heard Hozier’s song before, not any of his other music, but I do like his voice. Annie Lennox MADE the performance with her energy. I absolutely loved it. The second performance that I loved is of course from Sia. She brought Maddie Ziegler along with her, of course, and added actress Kristen Wiig. I’m upset ‘Chandelier’ didn’t win anything. I guess she’s invisible to the Acaedmy. 1000 Forms of Fear is still my favorite album of 2014. I’m for any and all things Sia. Unfortunately Sia didn’t win any Grammy’s DESPITE ‘Chandlier’ being an amazing song with amazing performances. I’m not discussing all performances simply because there’s nothing for me to discuss. I will say that I did like the Target ad being Imagine Dragons performing ‘Shots’ (click HERE for that review) LIVE from Vegas. Other performances were ok. I did like Katy Perry’s ‘By The Grace of God,’ and Miranda Lambert’s, ‘Little Red Wagon,’ but that’s about it. There was talk of Pharrell performing a different version of ‘Happy’ which shouldn’t have been allowed based off the title of the song. He came out looking like a hotel Bell Hop speaking the lyrics and having it spoken in different languages, excuse me, creepily whispered in different languages before the song took a dark turn. What was supposed to be ‘Happy’ sounded like something that belonged on a soundtrack to a scary movie. Another performance that I didn’t like was Rihanna’s with Paul McCartney and Kanye West. they all came out in suits and what not and did the song. As I stated in my review (click HERE for that), I don’t see this as a comeback track, but I’ll stick around for what’s coming. And Beck needs to respect artistry and he should’ve given his award to Beyoncè. In certain areas of music, I will say that there are a lot of artists that could be nominated yet they do get snubbed in one way or another. There’s not a huge presence of R&B aside from Beyoncè. Speaking of she won Best R&B Song for ‘Drunk In Love’ and fans watched her perform ‘Take My Hand Precious Lord’ as the introduction to the final performance of the night, ‘Glory,’ by John Legend and Common. The song on the Selma soundtrack was performed by Ledisi, a Grammy nominee, but she just sat back and watched as Beyonce did what she should’ve done. Also Kendrick Lamar might have been snubbed last year in the Best Rap Album category, but he ended up winning not one, but TWO Grammy’s this year for his track ‘i’; Best Rap Performance and Best Rap Song. Better late than never. Overall while the show moved rather quickly with few interruptions, it wasn’t all that entertaining to me. I love that there were a lot of performances, just not any that were upbeat enough to make the crowd dance like last year. Another thing was that these artists need to work on their acceptance speeches and keep them from 30-45 seconds. If you’re nominated you should have a speech prepared just in case. Well my first pick was right. ‘Royals’ will be battling ‘Just Give Me a Reason.’ Half of my second pick was voted, ‘Radioactive.’ I mainly voted for ‘Mirrors’ over ‘The Monster’ because it had beat ‘Can’t Hold Us’ in the first round. No surprise that ‘Get Lucky’ was voted for. It could’ve gone either way with ‘Thrift Shop’ and ‘Timber’, but as much as ‘Timber’ is played I’m not surprised it won. 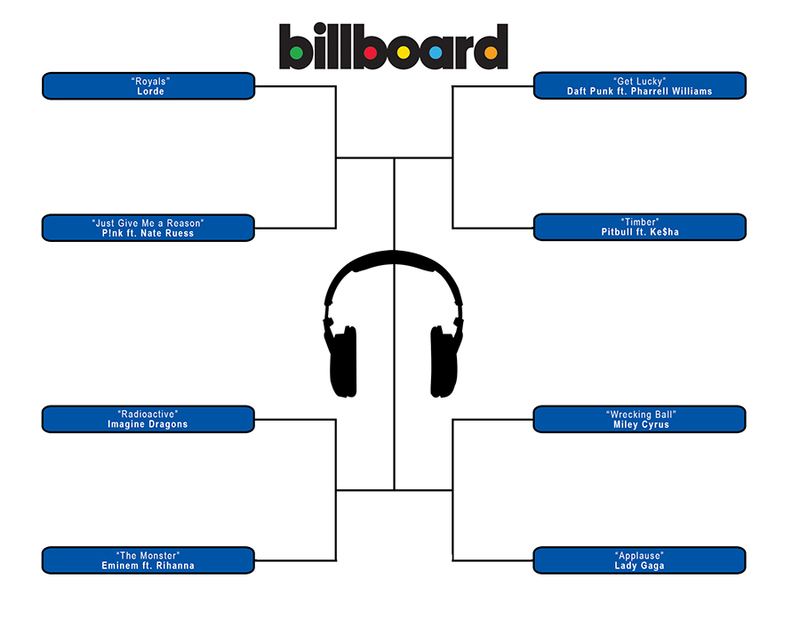 Lastly, I’m rooting for ‘Wrecking Ball’ and have been voting for it the entire time. Although Miley Cyrus’ antics can and are over the top at times it doesn’t take away from the message of this song. Anyway, back to the standings, ‘Wrecking Ball’ will be up against ‘Applause.’ I have been counting out Gaga this whole time. I guess simply because the song isn’t played recently I’m forgetting the buzz it once had. My final 4 votes are based soley on what I think the better songs are. I’m pretty sure other fans will vote otherwise. Stay tuned for next week for the OFFICIAL Final 4 standings! Jason Mraz had been holding the longest streak on Billboard Hot 100 for his track, ‘I’m Yours’ staying on the charts for 76 weeks. That was in 2008-2009. Imagine Dragons has broken that record with their debut single, ‘Radioactive,’ reaching its 77th week on the Hot 100. It’s unbelievable. There are few things more satisfying as an artist than seeing your music have longevity. But, we could never have expected to see one of our songs have legs like this. People seem to be connecting to it in personal ways, which is exactly what we hoped for. We’ve been out on the road and focused on touring for a long time. Somewhere along the way, we started to realize the song was taking on a life of its own. The track debuted on the Hot 100 the week of August 8, 2012 at #93 and has been steadily climbing ever since. Their album, Night Visions, is in its 76th week on the Billboard 200 soaring from #12 to #6 making it surpass 2 million copies sold to date. On February 21, 1990, Living Colour, became the first all African American band to win in the category for Best Hard Rock Performance for their song, ‘Cult of Personality’ at the 36th Annual Grammy Awards. Living Colour is a NYC band made up of Vernon Reid, Corey Glover, Muzz Skillings, and Will Calhoun. Dough Wimbish would later replace Skillings. Their debut, Vivid was released in May of 1988 peaking at #6 on the Billboard 200. It’s second album, Times Up, was released in 1990 and peaked at #13 on the Billboard 200. ‘Cult of Personality’ is well known among WWE fans with wrestler CM Punk using their song for his intro since 2011. They also performed live for his Wrestlemania 29 entrance. My Chemical Romance will be releasing a greatest hits album since the groups split in 2012. The compilation will be titled, May Death Never Stop You. There will be a $34.99 online edition that includes a DVD of its music videos, the previously unreleased clip of “Blood,” an armband and a “Thank You for the Venom” t-shirt — the first the band ever created. Read more to see what my favorite My Chemical Romance track is.